The new App won't open on my mac, is anyone else having this trouble? song not working. it worked before the update. I was after a while. If you go to the YGOPRO folder, control click the YGOPRO application, select contents > MacOS, you'll find a YGOPRO Unix Executable file. That'll allow you to run the application. You might have to still grant permission via system preferences first though. when is android 1.5.2 being released? o jogo ta bugando muito, cartas não ativam efeito direito ou nem ativam, a versão anterior estava muito melhor. Some of the spell/trade cards no long working properly. Dark Magic Veil and Dark Renewal will not special summon even condition and cost is paid. I can't get the option to special summon monsters from my hand like taketomborg or cyber drago, only normal summon, even if the conditions are met. I was able to summon this before the update. Am I supposed to press a button of some sort of click in a special way? Please help. The anime card Winning formula has an effect that I need to shout "The Winning Formula is Completed!" but since I last updated the game I cant find the option with that phrase and I cant use the card. After update, in my search-a-card bar, when i type letters/name, the characters are not in english text and so i cant search a card. This also applies in the deck name text box, typing produces the same non-english characters. there definetly are many bugs. I hope you will fix it soon. the Mac OS problem is really annoying but it´s good that even though its playable. please update soon because this version as it is is not good. 3. 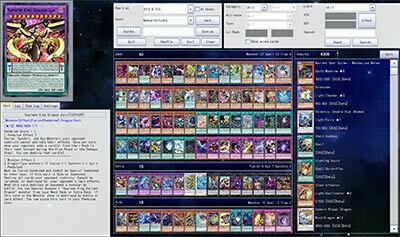 Run ygopro_vs.exe, and it still download files in expansions automatically. Ignore chain, Always chain, Available ----> it always reset to Always chain, please fix this. I kept getting the connection has been lost problem anyone knows how to fix it? The file crashed when Deck Edit is pressed. 3. Run ygopro_vs.exe, and it crashes when Deck Edit is pressed. 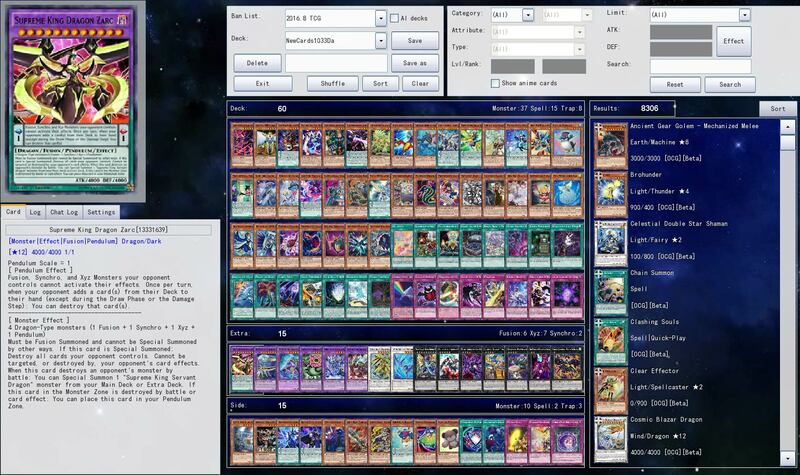 All i would like is AT LEAST a zoodiac AI deck on android for testing. Percival, faça uma atualização para jogar Ygopro no Android via Bluetooth. Hi Yugiohpro.Android version please ,when is android 1.5.2 being released? how I update my ygopro, when I open the game and put to update show arror mensage "error code 999"
hi i just downloaded the latest ygopro update on my mac (Sierra). it keeps closing itself every time i open it.... i've tried the code through Terminal and the game is accessible, but it's uncomfortable to write the data every single time. Is this because of the latest update? Do you guys have any tips? The operation can’t be completed because one or more required items can’t be found. Android version...when is realesed version 1.5.2? Accel Synchron can not work. when there zarc for android? The music isn't working in the update. Whenever I start a duel online or AI the music is muted. Is there any way to fix this problem? how can i join the game that already started? When will the new update be on IOS? Mac version keeps crashing every minute or so. Basically impossible to play, very annoying. Please fix this asap. Having problems with Seed of Flame. When destroyed via Fragrance Storm, Seed of Flame's effect doesn't activate, even though there's three viable targets in Graveyard. Ultra Polymerization's Graveyard effect isn't working. On Mac, Ygopro crashes when I use the Search bar in Deck Edit. Usually around the third letter. Yeah the game won't open my mac either. Is someone going to fix this soon? it seems that nobody is even attempting to implement link summoning into the system. It's been a while seen I played this game. Last time played on July 2017 if I'm not mistaken. Have a problem here, when I want to summon extra deck monster, an error notice occured? Pls help me! Thanks before. Wanted to report a bug with Gladiator Beast Noxious. The card is supposed to be indestructible in battle all the time, but it only works when it is summoned by its own effect which is incorrect since this effect is independent. I doubled checked the physical card and yugioh wiki as well. Bluetooth multiplayer and tag team duel would make this the perfect Yu-Gi-Oh! game on both PC and Android devices. Please, please do this. You've broke Accel Synchron. Synchron Explorer can no longer summon it. It's been about around 3 to 4 months now with no update for andriod. Anybody heard any words. We need those new cards. Game is constantly losing connection, although my connection is very good. Plays for a while then the game cuts out. Please fix servers. Are we getting the same update for YGOLITE for IOS?